Welcome to NASCIO’s online community! I’m so glad you’re here! My name is Danielle and I’m here to help you with your Community needs. Feel free to contact me via the community or by email if you have any questions. 1. Log in at https://community.nascio.org/home. Use the username and password that you received via email. Email Membership if you need help with your username or password. 2. Fill out your profile. We want to get to know you! 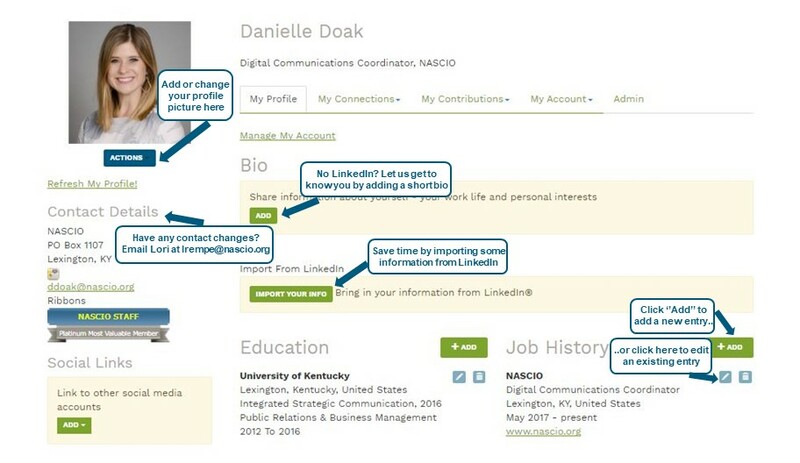 You can either fill out your profile manually, or you can import some of your information from LinkedIn. Be sure to fill out your Job History, Education, and other areas—these will help your like-minded peers find you! Completing your profile lets other users know who they’re talking with and allows them to attribute your great insight and advice to a friendly face. Email Membership if you have any contact changes. Watch a how-to get started video tutorial. 3. 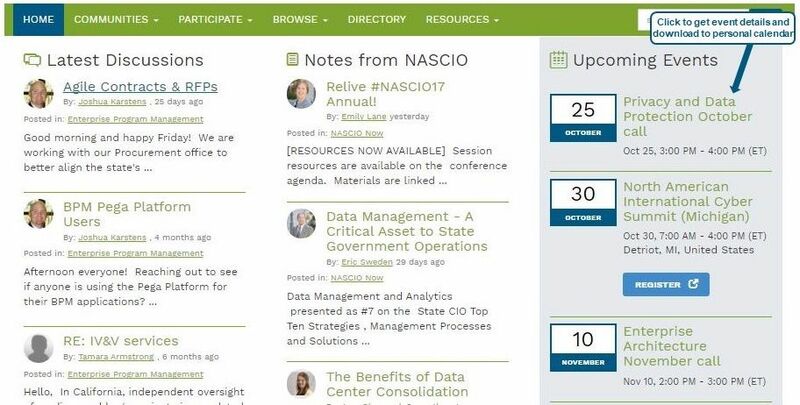 Notes from NASCIO: This is where you will find all public NASCIO announcements and blogs! Watch a how-to video tutorial. 4. Find all NASCIO Members in the Member Directory. Find anyone in the NASCIO Community in the 'Directory' tab! Search by name, state, email, job title and even city. From here, you have access to all NASCIO Members contact information. Watch a how-to video tutorial. 5. Don’t miss any NASCIO event with the ‘’Upcoming Events’’ calendar. Visit the community homepage to find the event calendar, which includes webinars, committee/ working group calls and more! Plus, download the event straight to your personal calendar. Watch a how-to video tutorial. 6. Join a NASCIO Committee and/or Working Group. Participate in NASCIO by joining a Committee or Working Group. You will achieve access to calls and webinars on those topics, and the availability to collaborate with NASCIO peers whom have similar interests. Email Membership if you have any questions. 7. Start or Reply to a Discussion. To post your own new question to the community, from the top navigation menu, click Participate, then Post a Message. Select which community you’d like the question posted into, add your subject and then type your question. You can add attachments if needed at the bottom of the screen. When you’re done, just click send! Watch a how-to video tutorial. If you’re already in the community you want to post to, you can click “Add” next to Latest Discussion Posts and follow the same steps as above. To reply to someone else’s post, click the blue, Reply to Discussion button. Type your response, add any attachments necessary, and then click send. In a community, everyone benefits from discussions because we all get to learn and problem solve together. But we also understand that there are times when it’s more appropriate to reply directly to a person, rather than the entire community. To send a private reply, click the arrow next to the blue “Reply to Discussion” button. From the drop-down menu, select “Reply to Sender”. Your response will only be sent to the person you’re sending a private reply to. 8. Check out the Library. The community is all about collaborating and learning from one another. The Library is the perfect place to share and download documents, videos, links, and more. To view a community’s library resources, first go into the community you want to see resources for. Once there, select “Library” from the community navigation. Once in the library, you can view the various documents within that specific library. To view an item in detail or to download the item, double click a document within the library. Now, click Download. The document will now download to your computer. Once you’ve added the file, click the blue Upload button. You can now select the green “Finish” button. To share a resource with the community and add it to the library, go into the community library you want to add the resource to. Click the green “Create New Library Entry” button. Enter the necessary information and click Next. Click “Choose and Upload” to select the document from your computer or other repository. 9. Collaborate with other NASCIO members in an Open Discussion! Want to create an Open Discussion with access for all or certain members to join and engage with each other on a certain hot topic? Let us know! Email Danielle at ddoak@nascio.org. 10. What are NASCIO members saying? Visit the NASCIO Community homepage to see this month’s featured image. Want to share your love for NASCIO? Submit your quote here. Watch a Featured Member video tutorial. 11. Corporate Perspective Blog Visit the Community homepage to see what our Corporate Members are saying in a blog on State CIOs Top Ten Priorities! Want to write a Corporate Perspective blog? Email Lori at lrempe@nascio.org. 12. Formal Tags Want more refined search results? Look for Formal Tags on the side bar of your search results and click any of the official tags shown. Hashtags help provide additional information or categorize content. 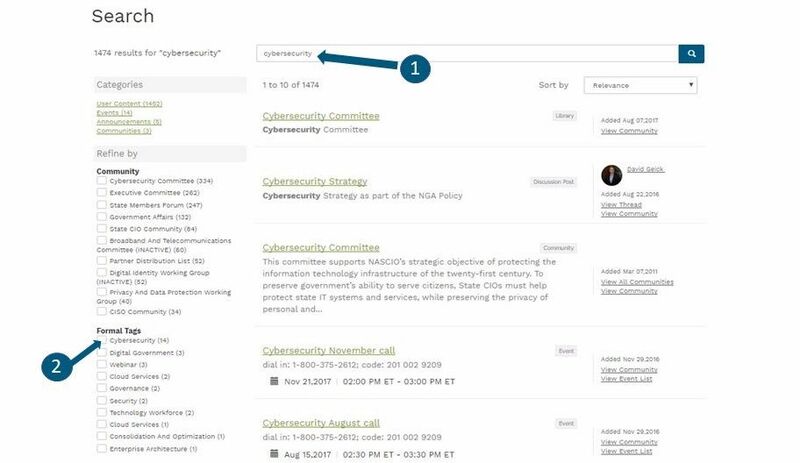 They also provide a shortcut to execute a search on a tag so that members can discover other content tagged with the same tag. For example, the user can click on a tag and will be directed to search results filtered by that tag. 13. What now? It's time to join the conversation! Let us know you’re here. Join a conversation or start one of your own. Give feedback. Use your knowledge and experience to answer other members' questions. Just click "Reply to Discussion" to the right of any discussion post, or comment underneath a library entry. Don’t forget to @Mention your peers in posts. Spread knowledge. Upload useful resources to the League community library, check out what others have uploaded, and keep the sharing going.